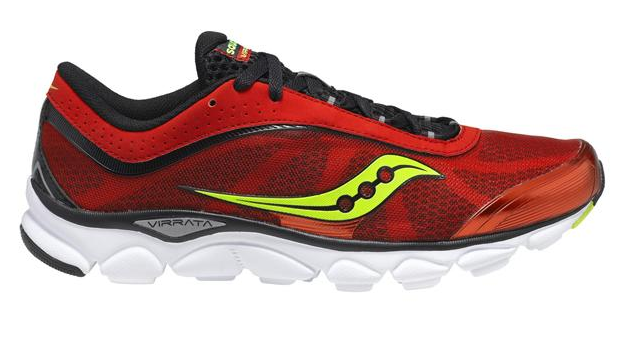 Saucony Kinvara 4, Virrata, and Peregrine 3…All in RED!!! However, I’ve never been able to get my training shoe, zero-drop shoe, and trail shoe all in RED at the same time. Well, it looks like that might be about to change! 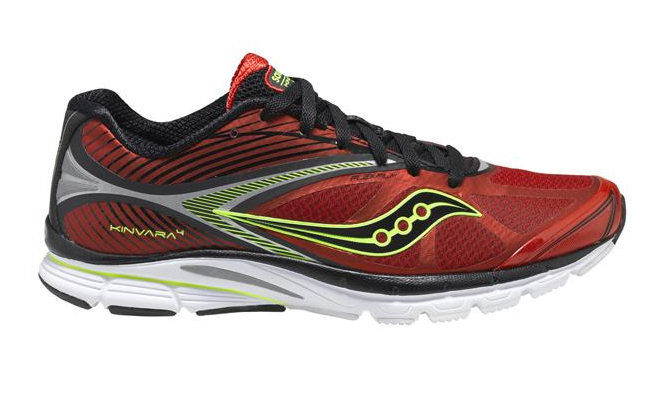 I am down to my last 2 pair of Kinvara 3s, so I should be ready for the 4s in about a month or so. Definitely going for these babies in Red and Citron! Since it looks like Saucony is going to do away with the zero-drop Hattori that I’ve been using for the past two years, I may give the Virrata a try. If so, this colorway looks about perfect! They are supposed to be released later this month. I’ve been running in the very first Peregrine trail shoes for the past 2 years, and it is about time for a replacement. Just found out that later this summer they are going to release the Peregrine 3 in Red and Citron! Yeah Baby!! This is the cover of the May issue of Boston Magazine. 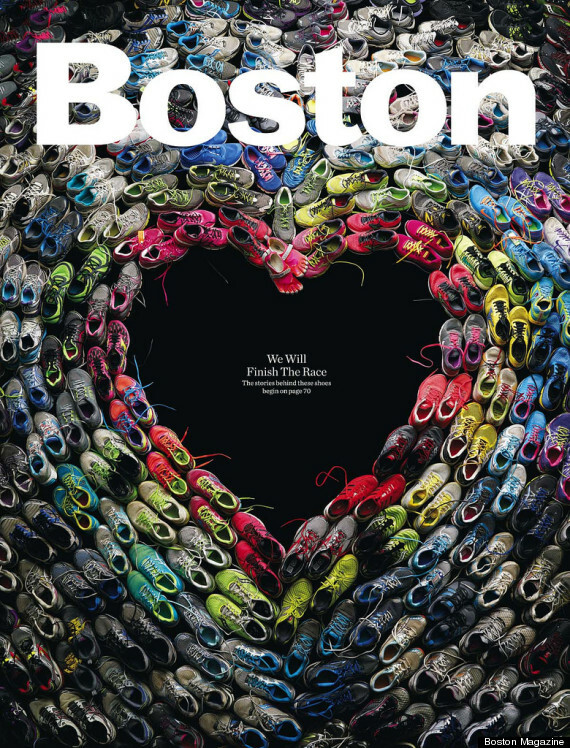 It is comprised of over 100 pairs of shoes worn by participants in the 2013 Boston Marathon. Inside the magazine are runner’s stories for 15 of the pairs, and many of the additional stories can be found on their website. This is fantastic. Then our design director, Brian Struble, and deputy design director, Liz Noftle, came up with the concept of taking shoes worn during the marathon and arranging them so that the negative space is in the shape of a heart. For reasons I’ll explain in a moment, I knew as soon as I heard the idea that we had our concept—not just for the collection of essays, but also for the cover. In fact, I quickly realized that the stories of the runners who wore those shoes would be even more powerful than the essays we’d commissioned. We quickly changed course and settled on the cover concept and the outlines of a feature package: We’d shoot the shoes collectively to form the heart, but we’d also photograph them as individual pairs to illustrate the stories told by the runners in the package (which we called “The Shoes We Wore,” and which you’ll find in the May issue). What an awesome idea, and amazing they were able to pull it off. 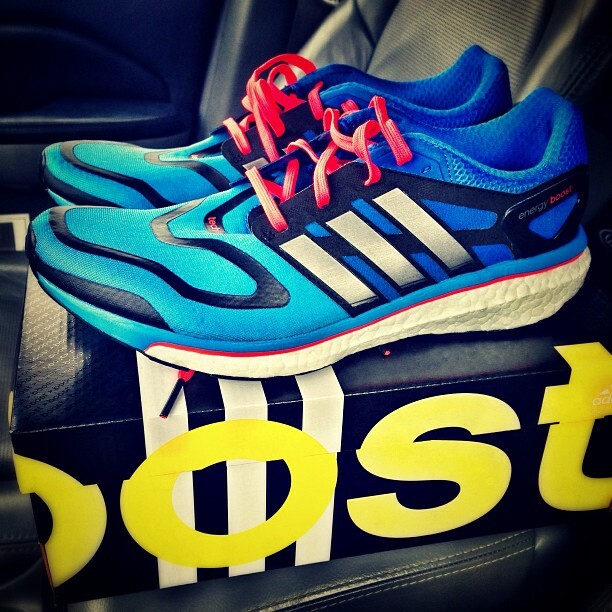 New kicks for NYC Marathon training – Adidas Energy Boost. Can’t wait to take these out on the road. A couple of weeks ago I posted about my interest in the adidas Energy Boost, and today they officially introduced two new shoes in the Boost line, which will only be available at the Boston Marathon expo next week before they are available to the general public in the fall. 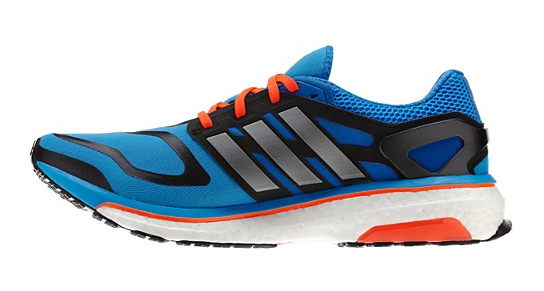 I’m particularly intrigued by the adizero Adios Boost model (pictured above), which is an updated version of the current world record marathon shoe. After the successful launch of Boost midsole technology with an energy return unlike any other, adidas is providing a sneak peek of the latest iterations with the unveil of the adistar Boost and adizero Adios Boost during the marathon. Limited pairs of each shoe will be available exclusively at the adidas booth at the Boston Marathon Expo before they go on sale to the public in August and October, respectively. 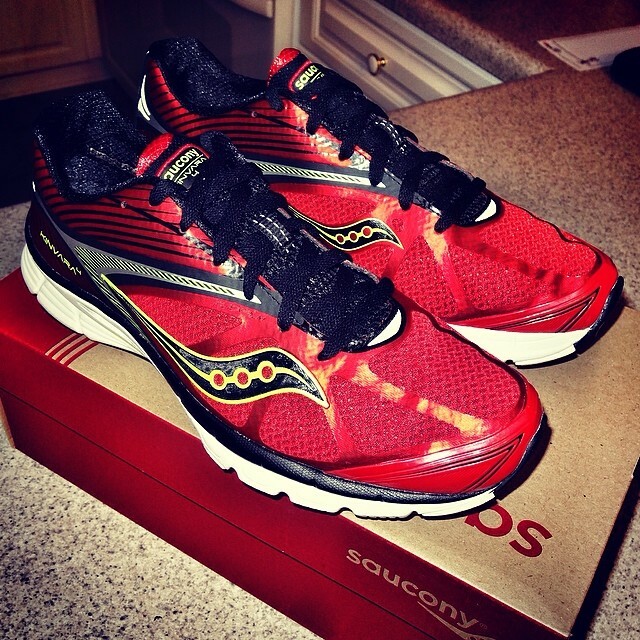 Anyone who has followed my blog for any length of time knows that I’m a HUGE Saucony fan. 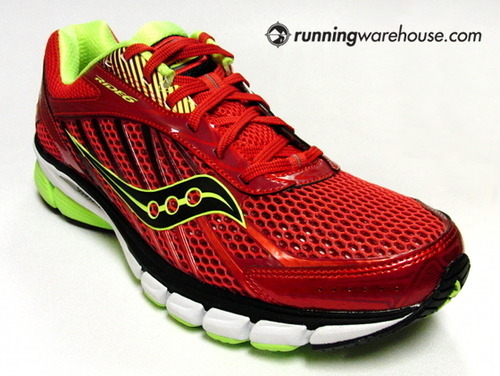 Though I’ve never tried the Ride before, most Saucony shoes seem to fit me really well (Kinvara, Hattori, Peregrine). In addition to looking pretty awesome, and being the perfect color, the Ride 6 is supposed to have even more heel cushioning than the 5, and is quite a bit cheaper than the Adidas Energy Boost that I also mentioned in a previous post. I mentioned in an earlier post about my plan for a change in shoe strategy once I come back from the stress fracture. Since the beginning of 2012 I’ve used the Saucony Kinvara for all training runs, regardless of the distance. 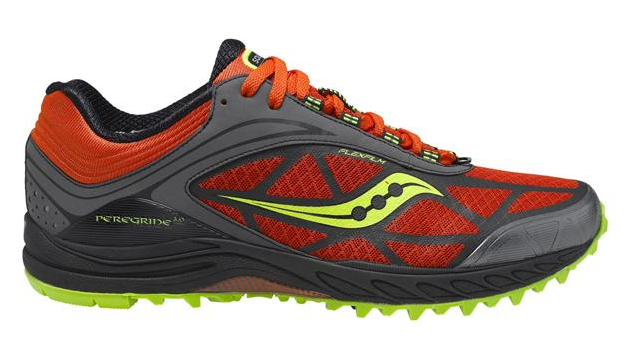 While I LOVE the Kinvara, I’m worried that it just doesn’t provide enough cushioning for my stride and foot strike on longer runs. 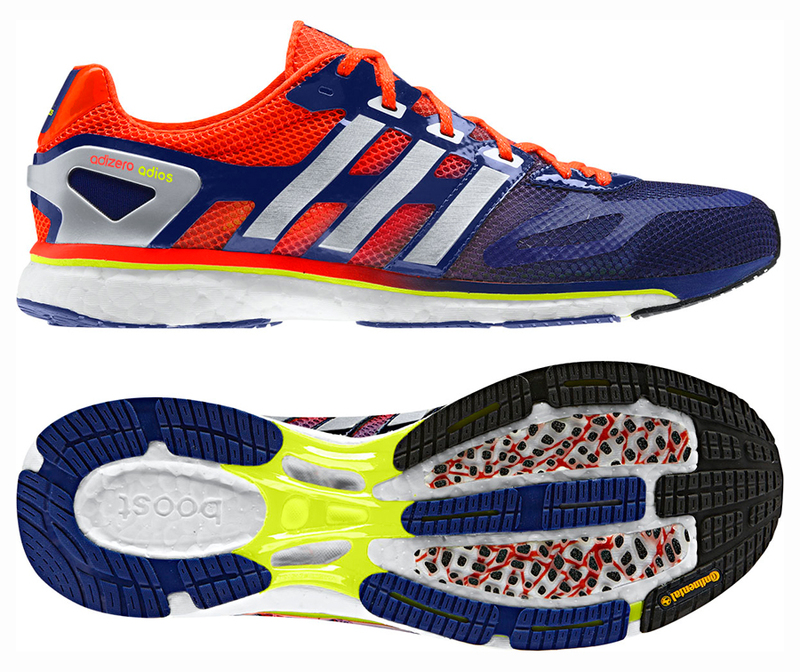 To that end, I plan to utilize a shoe with maximum cushioning for runs 10-miles or greater, and I am greatly intrigued by the new Adidas Energy Boost trainers that debuted last month. It also doesn’t hurt that I comes in my two favorite colors….Red & Yellow! Too bad it retails for $150! Anybody have experience with this shoe? Call Marathon Sports and ask if they will ship you a pair! Or shout out to Tumblrs running Boston!!! Let me know if u want me to pick up a pair for you when I am at the expo!!! I sincerely appreciate it, but my issue here is more that I don’t want to wear anything Boston Marathon related until I actually qualify for Boston. The cruel part about these shoes is that they just look so awesome!